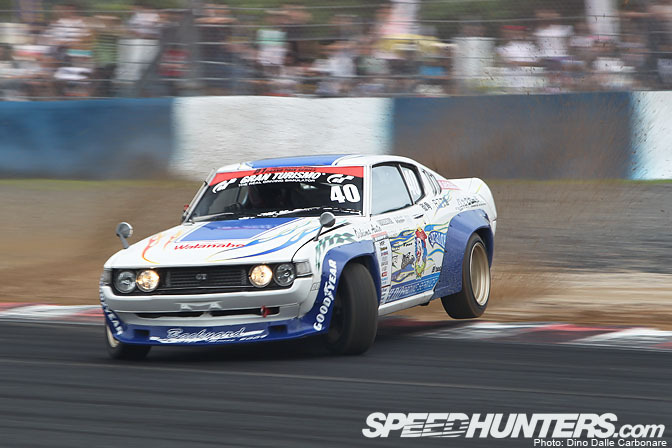 The entry into the judged corner at Okayama is unlike any other circuit that the D1 hits throughout the year. I literally spent half of the morning on Sunday mesmerized at just how close to spinning some drivers were coming as they angled their cars wildly in order to hit the apex on the tight first corner. It's basically a full throttle run down the long straight, up to top gear before throwing the car sideways with heavy use of the side-brake. It looks like a balancing act as they hold the car totally sideways straight down towards the entry with lots of use from the brakes too, most locking up all four wheels as they shave speed off to prepare for the corner. Kawabata is of course the master at this kind of maneuver! …much like Minowa in his wild yellow JZX90. …or this one taken a split second later when his rear tire lifted into the air! 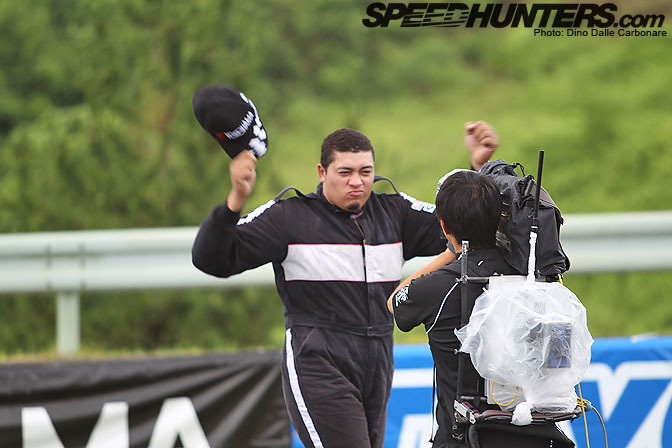 Orido went straight to first position with a "hyakuten" 100-point perfect run that had the judges and crowds going wild. If it wasn't for Orido I think half of the stands at D1 events would be empty! I have to give a lot of credit to Masao Suenaga, who was taking full advantage of the optimal weight balance of his FD3S to get some insanely wild angles on the first corner. How about this for an entrance from the judges! 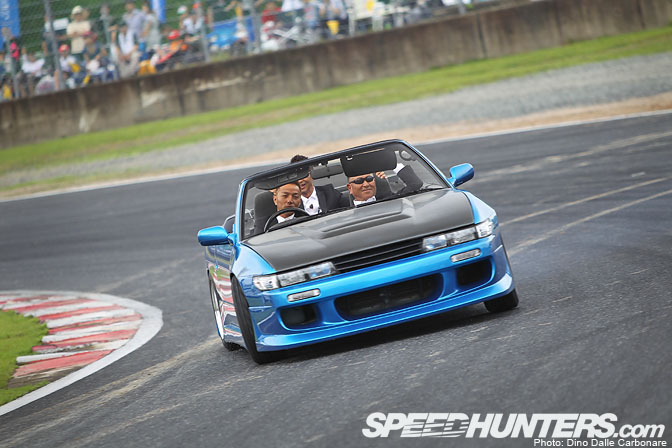 Kamimoto was showing off his drift skills in this chopped S13 with Inada-san and Tsuchia-san hanging on for dear life! 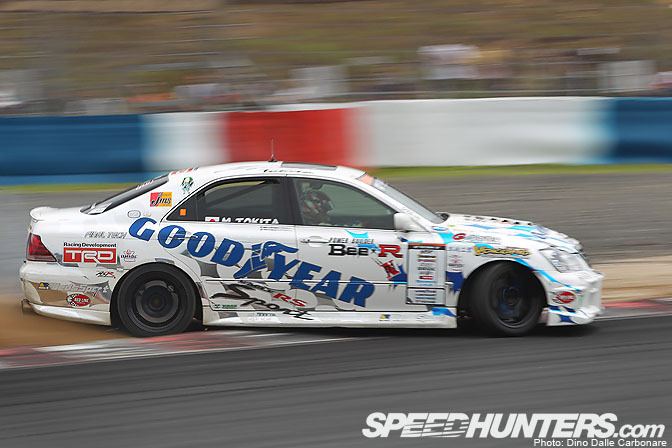 Mike Pollard is quickly becoming a star in Japan, although he was having a hard time with the T&E Soarer at this round, not able to make it into the Best 16. Talking to him after the event it turns out his side brake was hardly working, which pretty much hampered any attempt he had at scoring decent points. Mike, get Ueo to fit one of those trick hydraulic side brakes for you!! Tokita might be small, but if you mess with him he'll smack you around the head with his favorite weapon faster than you can realize what happened! 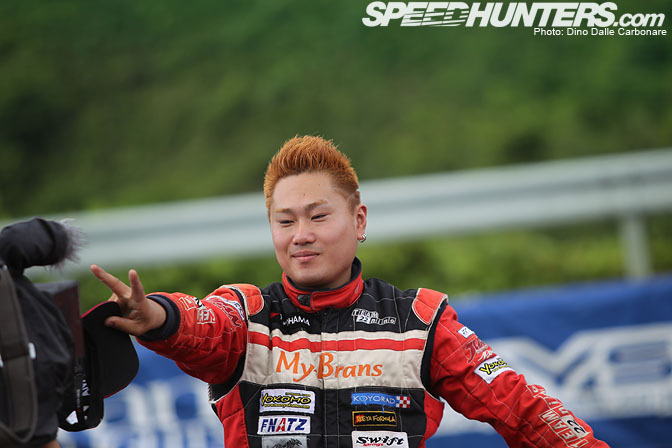 Saito sporting a new hair color. After this slight mistake, which ended up with the big GS grounded in the kitty litter, Hirota actually managed a very impressive run which allowed him to qualify for the Best 16. Unfortunately Takayama beat him straight off the bat but it was impressive to see such a new car get competitive so quickly. Well done Hirota & AS Mori!! 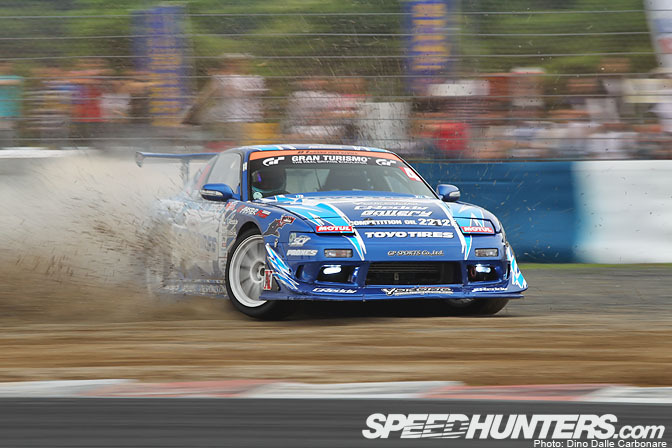 Fukuda getting on the power in his S15. 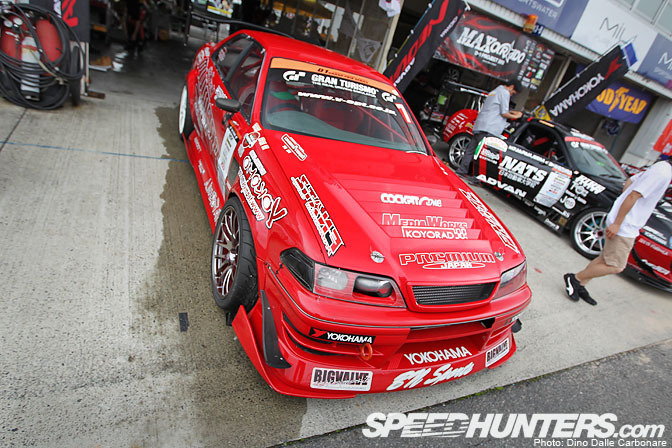 Takanori Yoshida's S13 sports the kind of stance that gets me very excited. Small diameter Equips running chunky sidewalls with plenty of stretch, the kind of look all drift cars should go for. However, like most cars in D1 now, the front end seems to sit way to high. Check out how the intercooler is in front of the radiator. See what I mean, absolutely stunning. Tokita holding on to that side brake lever all the way down the straight..
…which is a bit better than going for a full on drive in the loose stuff! Kunnyz's rear spoiler just keeps getting wilder! 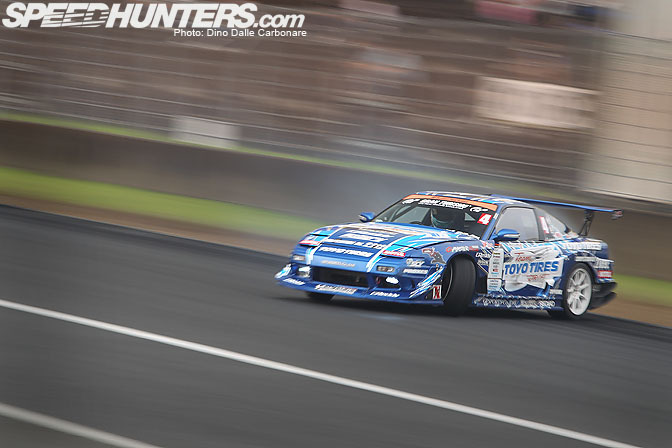 The very wide RYO S14 was sitting in the pits all Sunday but since Miki Ryuji failed to make it through the very wet qualifying session on Saturday, finishing in 21st position, this is where it stayed for race day. 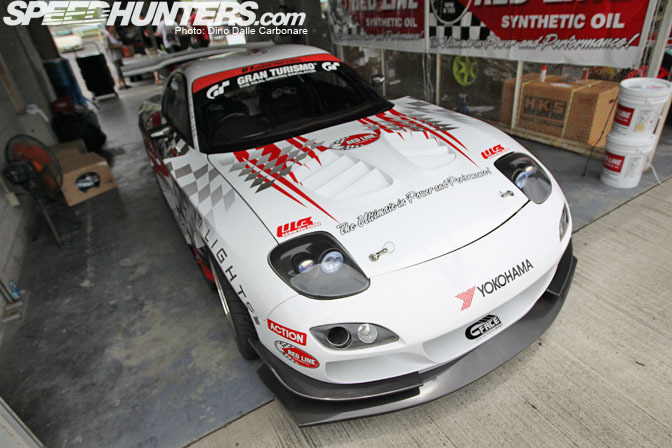 Yoshioka's new 4-rotor Magic FD3S looks phenomenally good but since the car is still not finished we will have to wait, hopefully, until the next round in Ebisu to see it in action. I'm sure Yoshioka's is very frustrated! Watch out for a spotlight on this thing soon. While some of the people that come to D1 are there to see the drifting a good half of them are there for "other" things LOL. Most "racequeenhunters" rock some pretty crazy equipment too. You will have to wait for Part 3 to see the tsuiso battles from Okayama! Back soon! can't wait for the reature on the 4 rotor fd. side brake? correct me if im wrong, but dont u mean hand brake? Side brake? It's called hand brake, or E-Brake. Need a new writer as this is a lame write up. Awesome pictures, but poorly written. 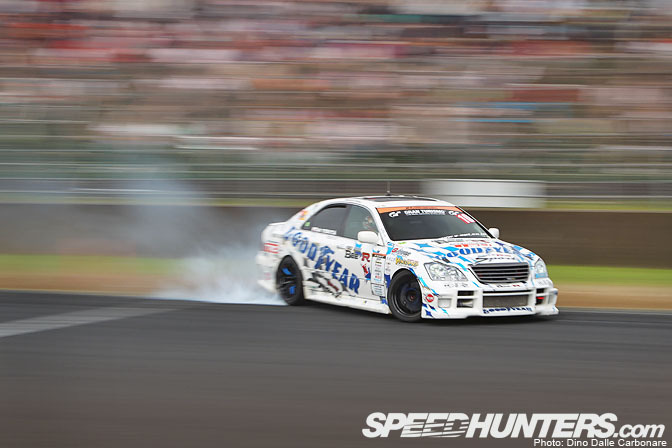 I've just heard, Hiromu Naruse, Toyota's chief test driver has been killed. 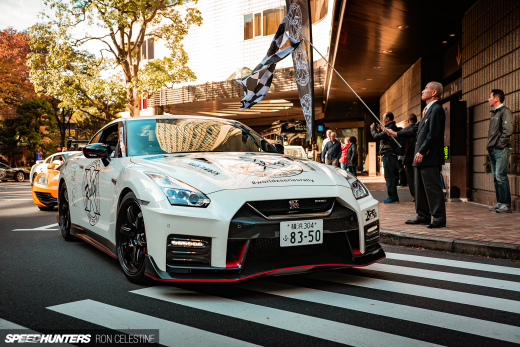 He was driving a Nurburgring Edition LFA and hit a prototype of the new 3 Series head-on. It happened on small a public road near the 'Ring. Sometimes I just don't get Ryo-san. Fujio couldn't cut it and neither can Miki. He needs to get Jikuya behind the wheel of that damn car. At least he might be able to make it into the Top 32. Ha! 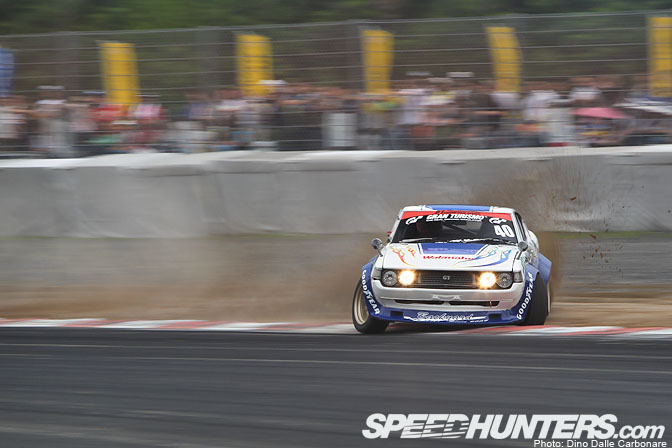 More on the Celica please! Actually Adam, in Japan they refer to it as a Side-Brake. So, seeing as he is in Japan and covering a Japanese event it's rather appropriate to use the term Side-Brake. SAIDO-SAIDO! SAIDO-SAIDO! SAIDO-SAIDO! SAIDO-SAIDO! SAIDO-SAIDO! SAIDO-SAIDO! SAIDO-SAIDO! SAIDO-SAIDO! SAIDO-SAIDO! SAIDO-SAIDO! SAIDO-SAIDO! SAIDO-SAIDO! SAIDO-SAIDO! SAIDO-SAIDO! SAIDO-SAIDO! SAIDO-SAIDO! SAIDO-SAIDO! SAIDO-SAIDO! SAIDO-SAIDO! SAIDO-SAIDO! SAIDO-SAIDO! SAIDO-SAIDO! SAIDO-SAIDO! SAIDO-SAIDO! SAIDO-SAIDO! SAIDO-SAIDO! SAIDO-SAIDO! SAIDO-SAIDO! SAIDO-SAIDO! SAIDO-SAIDO! SAIDO-SAIDO! SAIDO-SAIDO! SAIDO-SAIDO! SAIDO-SAIDO! SAIDO-SAIDO! SAIDO-SAIDO! SAIDO-SAIDO! SAIDO-SAIDO! please get some pics of the s15.3! PLEASE! Impressive shots and good story!! More shots of the race queens please! found my new favorite car. can you make a background of the first celica pic? pretty please? can we get some more coverage of Magic Mike Pollard? I don't see any other young rookie fresh on the pro scene in the US making a name for themselves in Japan... lets keep an eye on this guy he's flying so far under the radar in the US and he's from the US! Is this in Okayama? I think this is crazier than Kawabata's entry because it was done in a tsuiso run. Suenaga was shocked with Koguchi's angle that he crashed. 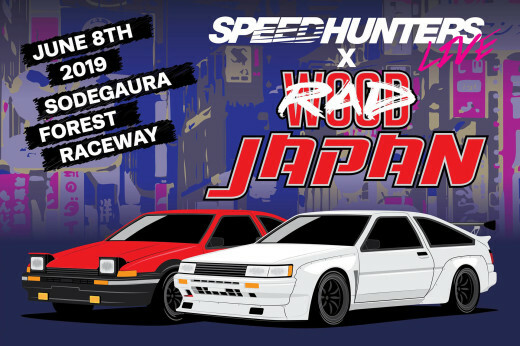 notice how Adam isnt a writer for speedhunters, strange. great pictures, and great article. 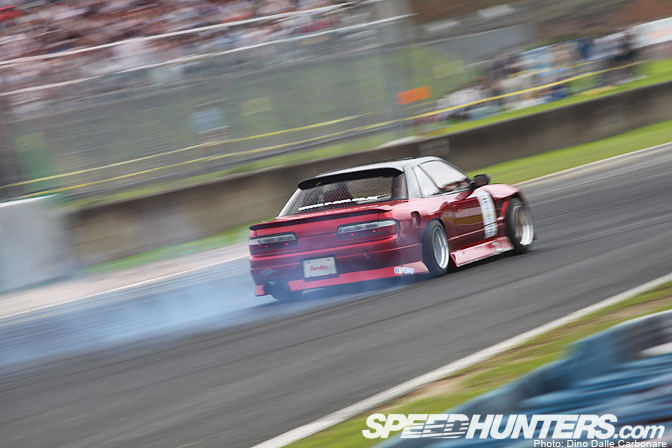 MORE of Takanori Yoshida's S13 please! Possibily a 1280 x 800 wallpaper of the last pic of it?